Because Collin wants to see where the "magic" happens. 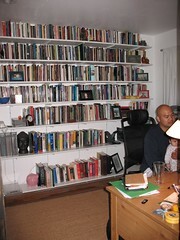 The books are mostly poetry in alphabetical order ('cause that's how I roll). The bottom two shelves are reference and books I'm using for the teaching quarter.